Barry Colla and Terry Smith. Two names you don’t always think about when it comes to a card set. Combining Barry Colla’s photos with Terry Smith’s artistic talents, you get 1993 Diamond Marks. The 1993 Diamond Marks set consists of 120 bookmark shaped cards that measure 2.5″ x 5″. There are no autographs, relics, short prints, or rookies to look for. This product has very little to offer. Boxes came with 48 sealed 10-card packs. 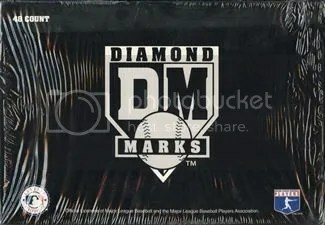 Every box should have at least one 1993 Diamond Marks Art card. The art set has 8 cards and have a painted look to them. They’re probably the nicest looking cards when it comes to this product. The only Diamond Marks cards that have any real demand come from the prototype set. In order to gain the approval from MLB, a 6-card prototype set was produced. This is a common practice when new companies want to use MLB team names and logos. MLB likes to see what the product might look like before they give them the ok. Card Collectors Co. was the main distributor of Diamond Marks. They ran a promotion in which dealers could obtain one prototype with their order. Player collectors seem to really like these prototypes. Three Will Clark prototypes have shown up for sale recently. Two of them went for around $90.00, while another got into a bidding war and sold for $255.00. All of the prototype cards say “1993 Prototype” on the back. Sealed boxes are easy to find and cost about $40.00.